The story of Uxbal. Devoted father. Tormented lover. Mystified son. Underground businessman. Friend of the disposed. Ghost seeker. Spiritual sensitive. A survivor at the invisible margins in today’s Barcelona. Uxbal, sensing the danger of death, tries to reconcile with love and save his children, as he tries to save himself. Uxbal’s story is simple: just one of the complex realities that we all live in today. Jeffrey Wells (Hollywood Elsewhere) writes, "sad and deeply touching hard-knocks, lower-depths drama in the tradition (or along the lines, even) of Roberto Rosselini's Open City or Vittorio DeSica's The Bicycle Thief. How's that for high praise out of the gate"
Kirk Honeycutt (The Hollywood Reporter) writes, "it's a gorgeous, melancholy tone poem about love, fatherhood and guilt. Some scenes are absolutely wrenching to behold. Others hit home with a punch to the solar plexus. Spain -- and Barcelona to be specific -- has beckoned forth the wistful poet in the Mexican-born filmmaker. His response to this summons is a film that, while about death, is teeming with life in all its tangled messiness." Sukhdev Sandhu (Telegraph UK) thinks differently, giving it 2 stars, describing it as "another laborious stretch of designer depression, a remorseless headache that begins with a mysterious chap telling a ponytailed Javier Bardem: “When owls die they spit hairballs out of their beaks.” Does that sound profound? Or does it reek of cod-spiritual phooey?" 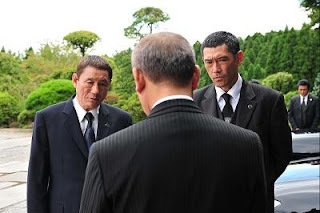 Maggie Lee (The Hollywood Reporter) writes, "As violent, amoral and misanthropic as a Jacobean play, "Outrage" is Takeshi Kitano's first yakuza flick since "Brother" (2000), and arguably his best film in a decade." Brad Brevet (Ropes of Silicon) gives it a C+, "Outrage exists in an effort to explore the various amounts of violence that can be dispensed in the midst of a yakuza turf war in the Japanese underworld. With an overwhelming measure of inventive kills, Outrage invites its audience to the slaughter with a story in which cooler heads prevail, but it isn't really much more than that. I laughed with and enjoyed this film, but it didn't strike me as any kind of overwhelming achievement." A symphony in three movements.. Things such as A Mediterranean cruise. Numerous conversations, in numerous languages, between the passengers, almost all of whom are on holiday... Our Europe. At night, a sister and her younger brother have summoned their parents to appear before the court of their childhood. The children demand serious explanations of the themes of Liberty, Equality and Fraternity. Our humanities. Visits to six sites of true or false myths: Egypt, Palestine, Odessa, Hellas, Naples and Barcelona. 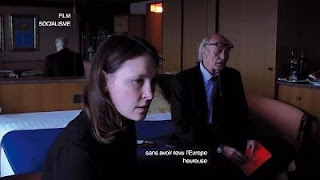 Peter Howell (Toronto Star) writes, "The film exhibits many of Godard's signature tropes: the indifference to narrative, shock cuts between images and the liberal use of text on the screen ... Asking what it all means is like asking Lady Gaga to explain her latest costume. Godard delights in obscurantism, and he considers it a success if you leave his movies with a headache. But he retains his dry wit, through such visual puns as a girl standing at a gas station pump, reading a paperback of Balzac's Illusions perdues while a llama looks over her shoulder." 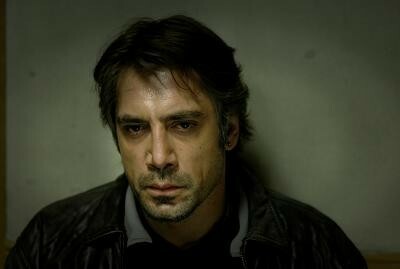 New Javier Bardem? I'm over the moon! I love that guy!